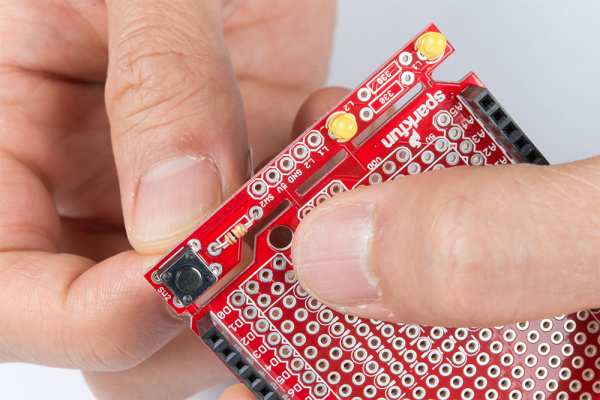 The SparkFun Arduino ProtoShield PCB and ProtoShield kit lets you customize your own Arduino shield using whatever custom circuit you can come up with! 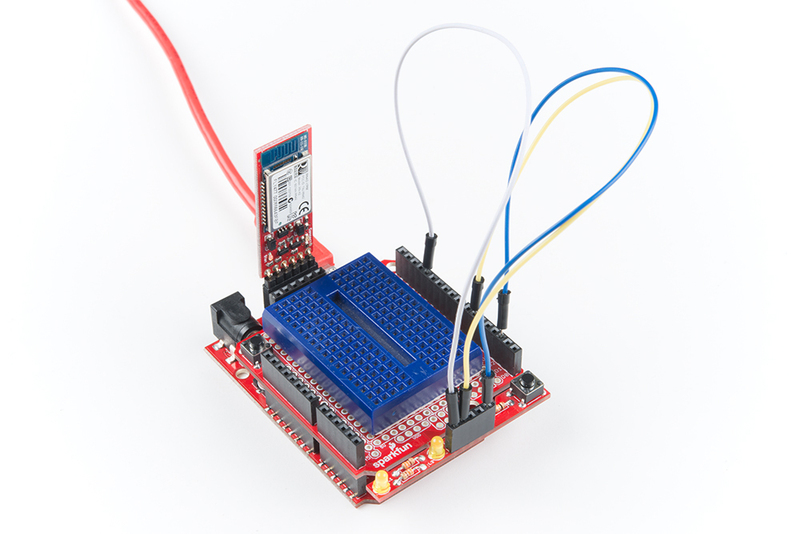 This tutorial will go over its features, hardware assembly, and how to use shield. To follow along with this project tutorial, you will need the following materials. Depending on what you have, you may not need everything listed here. Add it to your cart, read through the guide, and adjust the cart as necessary. 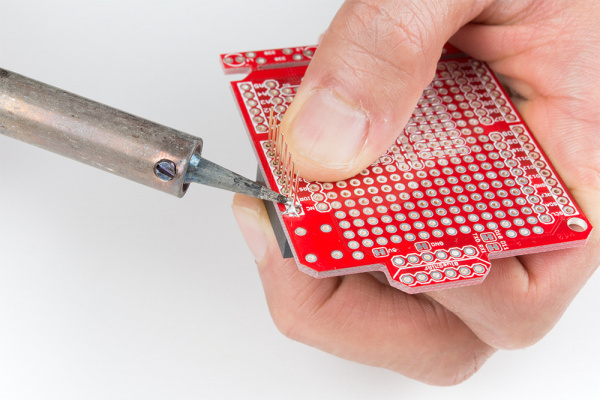 You will need a soldering iron, solder, general soldering accessories, and the tools listed below for prototyping. 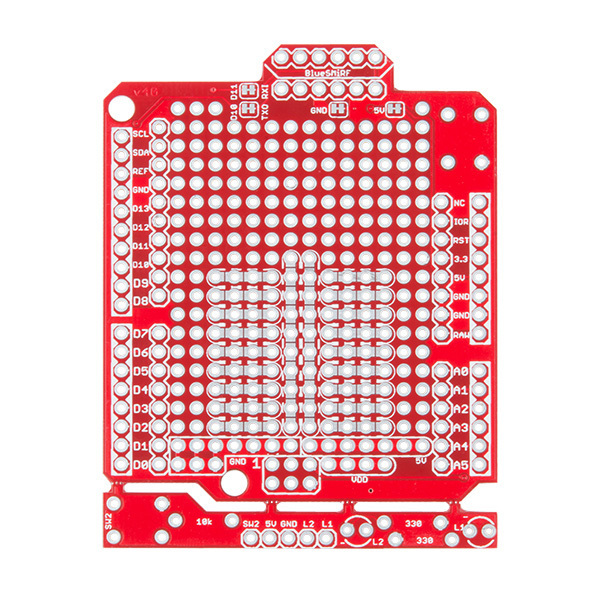 There is a lot going with the ProtoShield so it is useful to know what side we are referencing when soldering components to the board. We will refer to the top side based on the board's name on the upper right hand corner. The bottom will be the side with the jumpers. 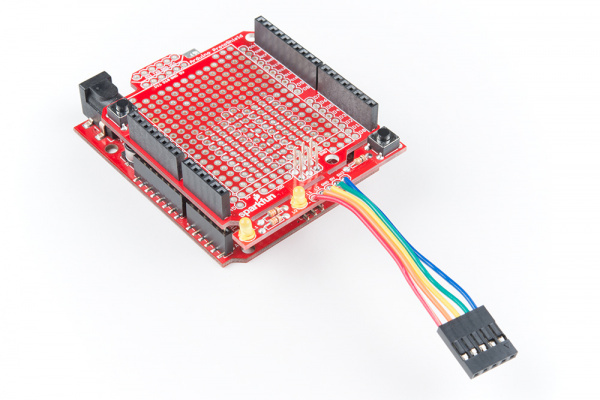 The Arduino ProtosShield is based off the Arduino R3's footprint. Headers can be installed on the pins located closest to the edge of the board. You will notice that the location of the headers are highlighted in a rectangular silkscreen. 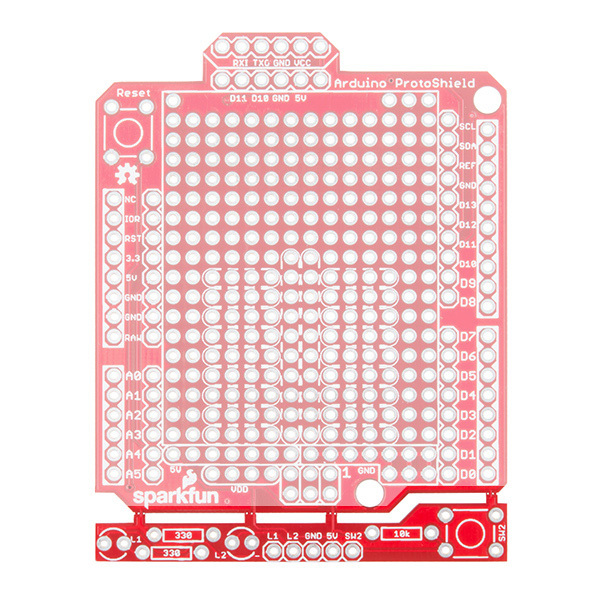 For those using the stackable headers included in the kit, make sure to insert the header from the top side and solder from the bottom. These pins are also broken out on the other side of its labeling. You will notice that the 1x10 header on the upper right side of the board is slightly offset from the Arduino R3 footprint. Don&apos;t worry, this was intentional so that you can place the board on a standard breadboard! Next up is the sea of plated through holes. Look at all that great space for prototyping projects! Do you have a small circuit on a mini-breadboard connected to your RedBoard or Arduino Uno? 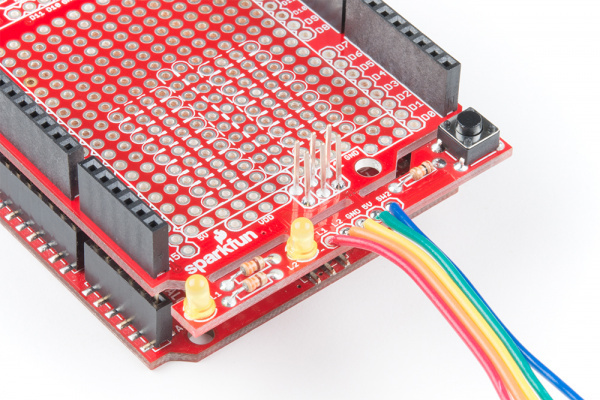 The ProtoShield has a spot to place a mini-breadboard on top to keep everything together. 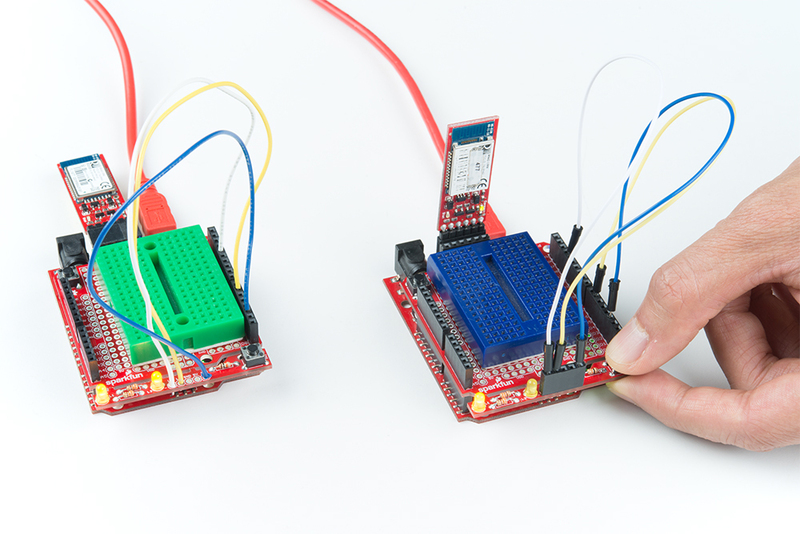 Peel the adhesive off the mini-breadboard, align it to the silkscreen, and stack it on! 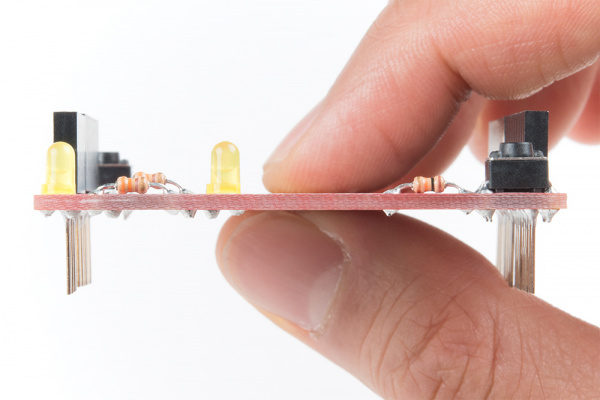 Once you are done prototyping your circuit on the mini-breadboard, there is an option to solder the circuit directly to the board for a more secure connection. The bottom half of this area was designed with a breadboard in mind. You will not notice too much on the top side. 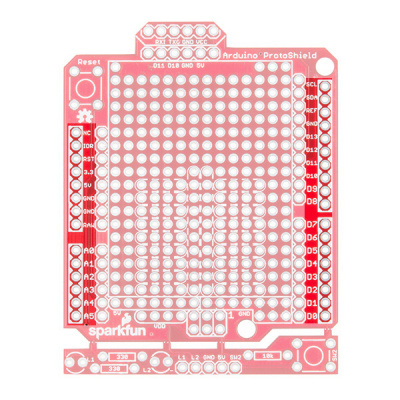 Flip the board over and you will see open jumper pads between each through hole to make a connection like a breadboard. 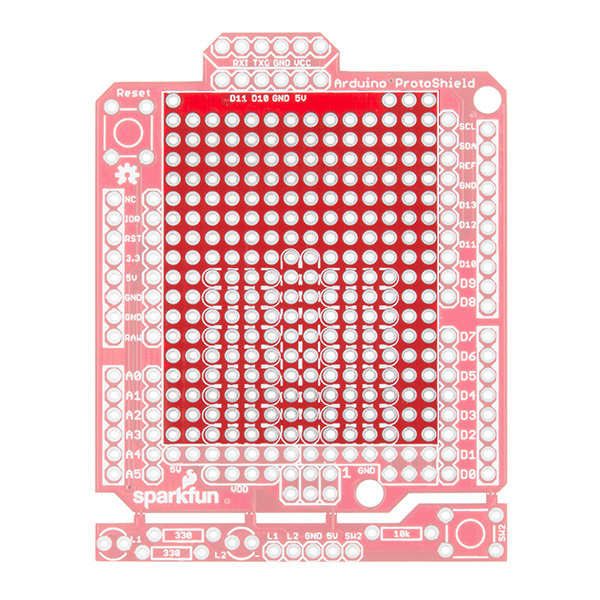 Once you add a component, simply add a solder jumper between holes to make a connection. 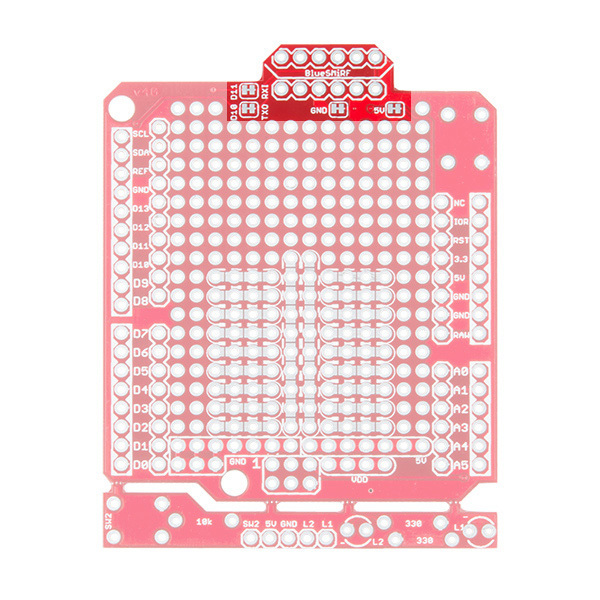 For those that prefer the standard prototyping pads, we left the other side as is. 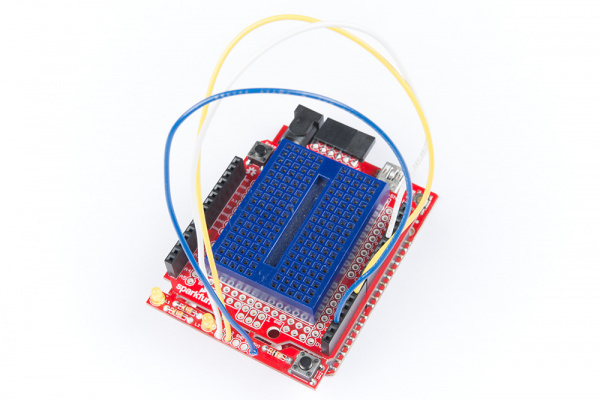 Need to access the Arduino's ICSP pins? The pins are broken out if you do not want to remove the shield every time you need the ICSP pins or if you decide to stack another shield on top of the ProtoShield. You will need add two 1x3 stackable headers. Note: The MISO, MOSI, and SCK pins are not connected (NC). 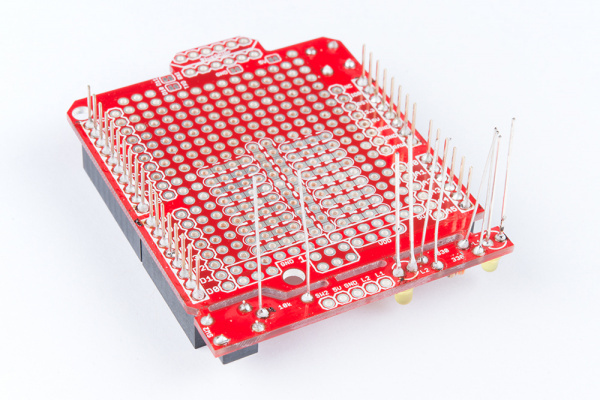 Additionally, there may not be enough room for a mini-breadboard if you decide to add 1x3 stackable headers to the ICSP pins and then stack an additional shield on top. You will need to go with a lower profile by soldering the circuit with wires to the ProtoShield. ⚡ Oh snap! 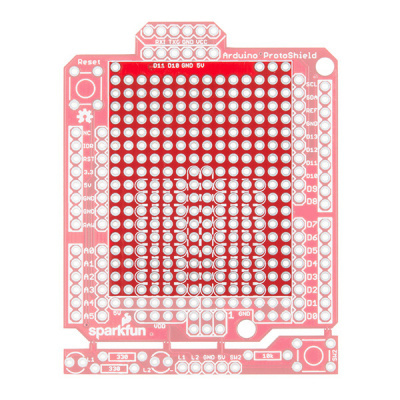 This shield was designed for the Arduino Uno footprint. If you are using a variant with 3.3V logic level on the ICSP pin (i.e. 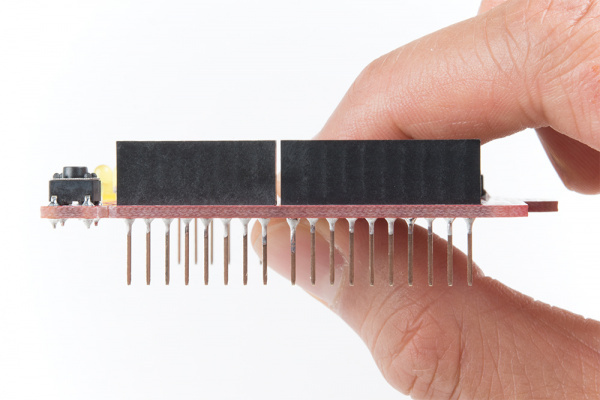 SAMD21 Development Board or Arduino Pro 3.3V/8MHz), you will need to cut the two traces connecting to the 5V pin on the 1x3 ICSP header. There are a few locations along the outside of the board for power and ground. Let&apos;s focus on the power rails in the prototyping area. Just below the silkscreen for the mini-breadboard is a 5V rail. 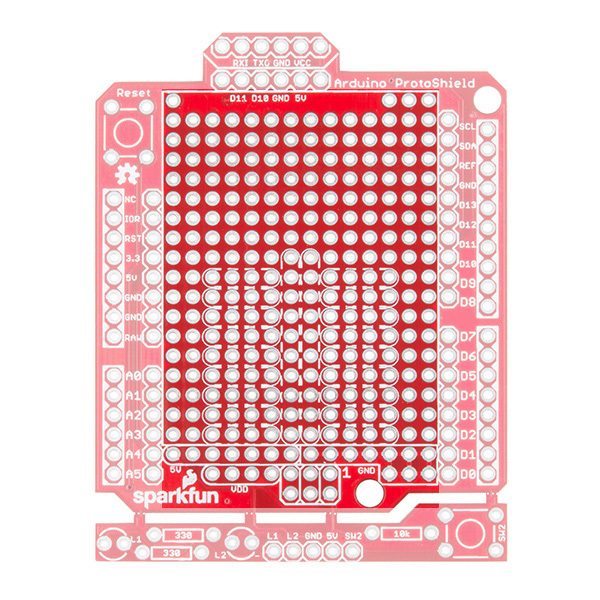 This is connected to the 5V pin from your Arduino. Need a different voltage? We squeezed a VDD rail just below. It is currently not connected to anything. We left it up to the user to connect to Arduino&apos;s 3.3V pin or another regulated voltage (i.e. 2.8V or 1.8V). Need to ground more circuits? There are few more ground connections on the board as indicated by the image below. Stacking a shield on an Arduino can make it hard to reset the microcontroller. Like other Arduino shields, the reset button has been rerouted on the ProtoShield. 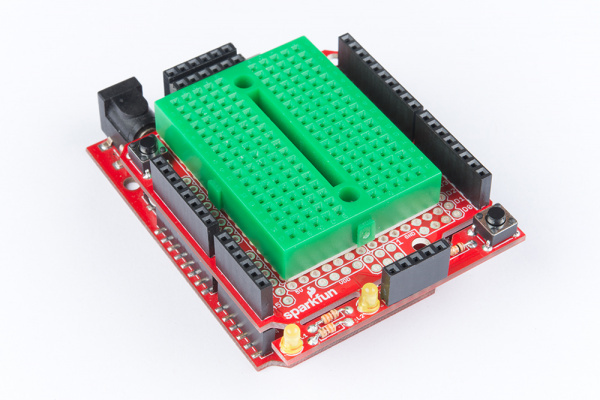 The SparkFun Arduino ProtoShield breaks out a software serial UART port. 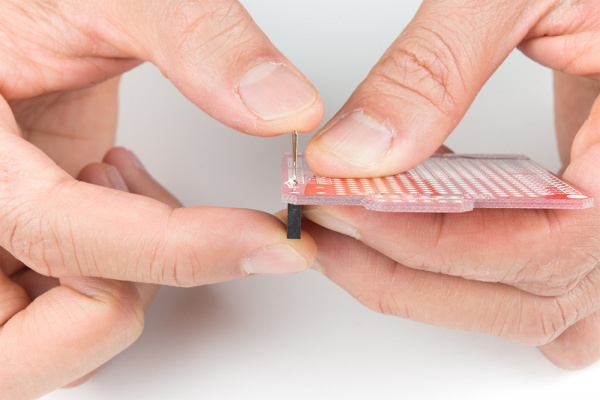 The pins are arranged in such a way as to connect to our BlueSMiRF if you decide to go wireless. 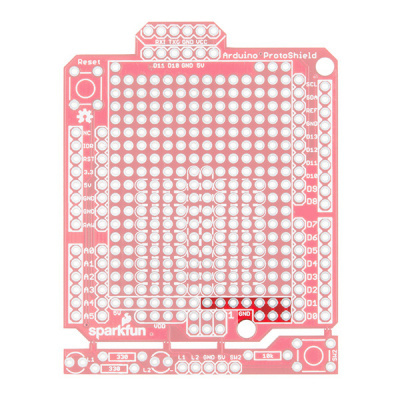 If you decide that you want to connect a different serial UART device or use different pins for serial, we added closed jumpers on the back. Simply cut the traces and reroute the connection by adding wires to the headers. 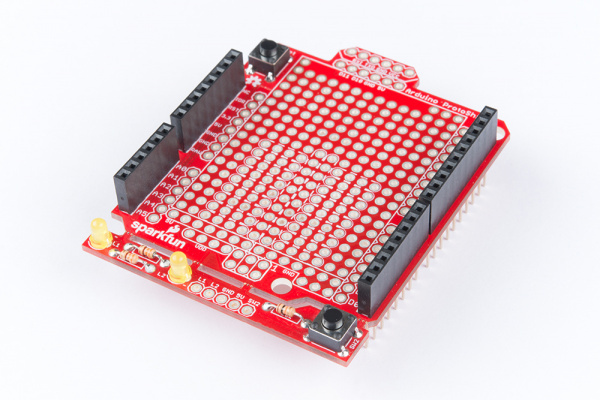 The board includes prototyping hardware that is based on the ProtoSnap design. When you are finished testing and want to use bigger components, simply snap off the bottom of the board using pliers. When viewing the board from the top, there are two locations for 3mm LEDs and their 330Ω current limiting resistors. 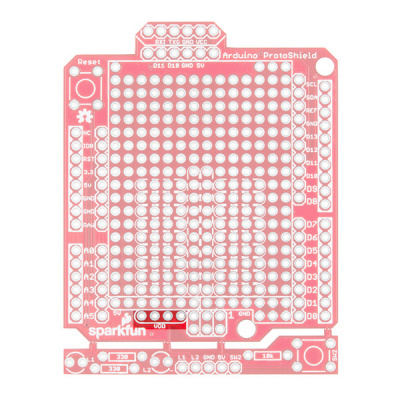 Note: The LED pins L1 and L2 are not connected (NC). To control, simply solder a wire from L1 or L2 to an I/O pin. Ground is currently connected to the rest of the shield between the mousebites. We left it up to the user to choose and solder these connections. There is a spot for a momentary pushbutton and 10kΩ pull up resistor on the other side of the LEDs. Note: The button (SW2) is not connected (NC). To control, simply solder a wire from SW2 to an I/O pin. 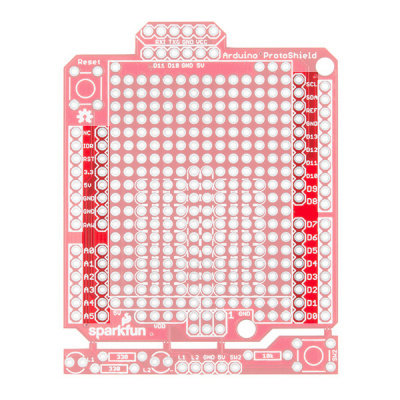 5V and ground are currently connected to the rest of the shield between the mousebites. We left it up to the user to connect. 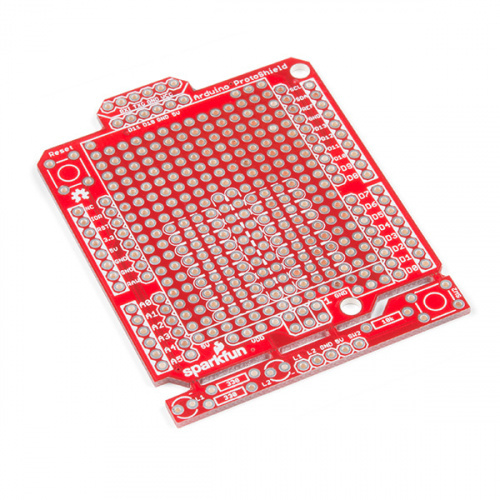 Grab a female stackable header and slide it from the top side of the ProtoShield. With your soldering hand, pull the header with your index finger and thumb toward the edge of the board. 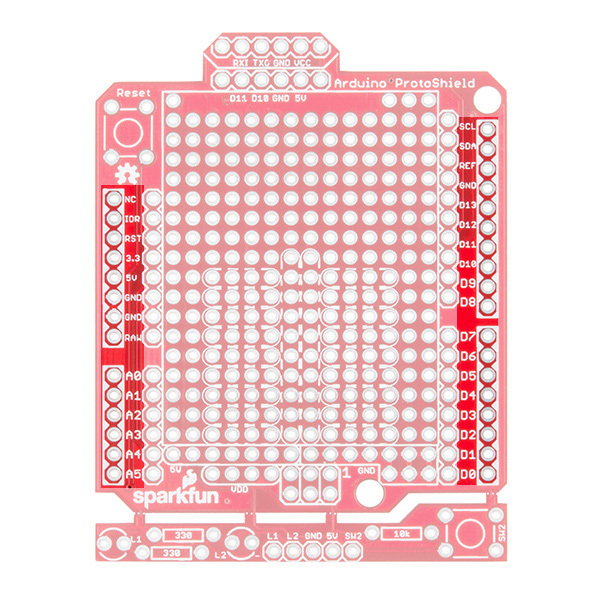 Using your other hand, push against the header using your index finger and grip the board with your thumb. Hold the header down with your middle finger. 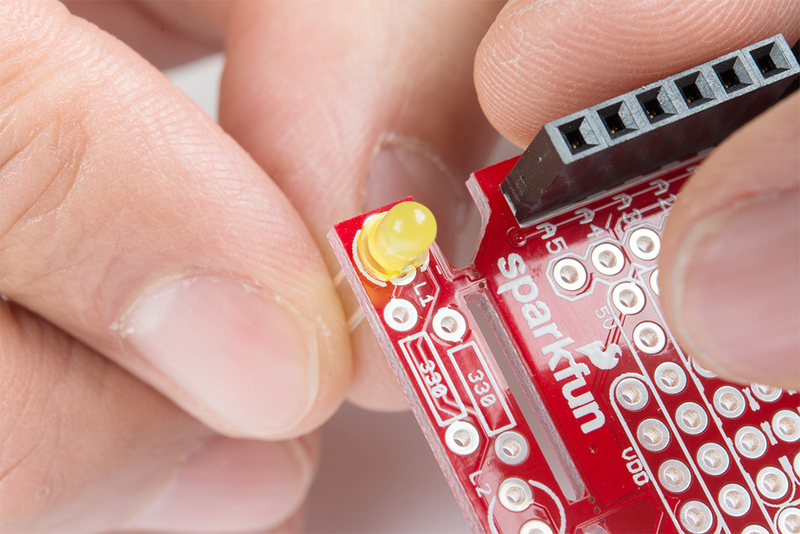 Grab the soldering iron with your soldering hand and tack on one pin. Repeat for each header. Insert the buttons for reset and prototyping. You may need to bend the buttons to fit into the through holes. Careful not to snap off the prototyping area! 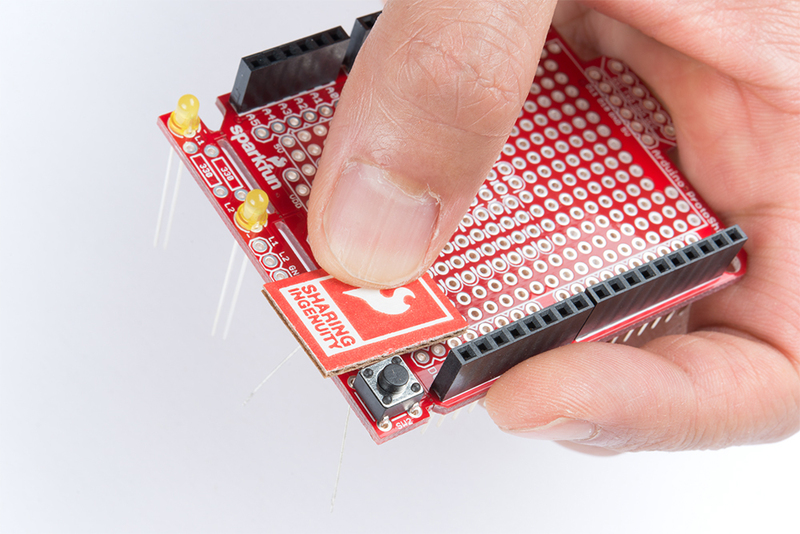 Hold the button against the board and tack some solder on one pin. Find the 3mm LED&apos;s cathode side and align it with its silkscreen labeled with a "—" sign. Slide the LED in from the top side and tack on a pin. Repeat for the second LED. 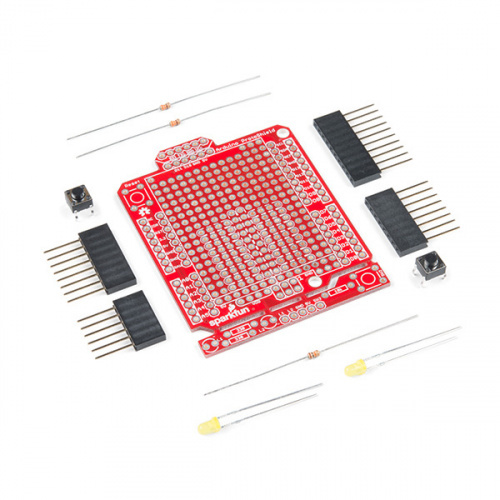 The kit includes resistors with two different values. 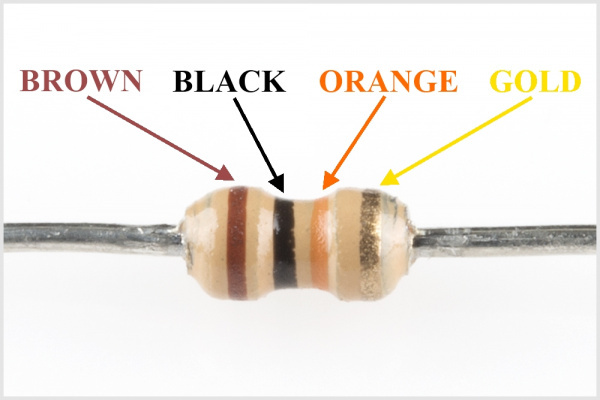 There is one 10k&ohm; resistor [color band = BROWN, BLACK, ORANGE, GOLD ] that is used as a pull-up resistor. 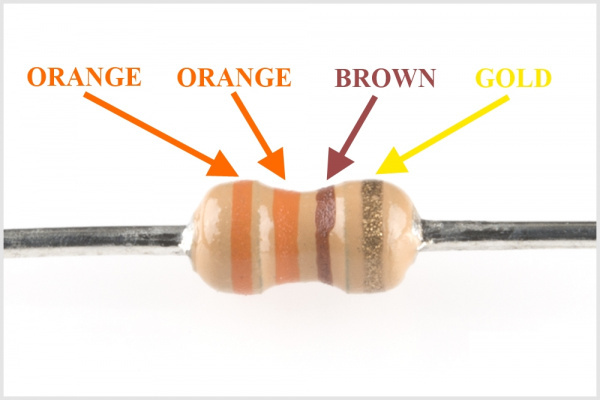 The two 330&ohm; resistors [color band = ORANGE, ORANGE, BROWN, GOLD] are used to limit current to the LEDs. Let&apos;s start with the pull-up resistor. Bend the 10kΩ resistor&apos;s terminals. Then slide the pins where it says "10k". Bend the terminals to hold the resistor in place for soldering. 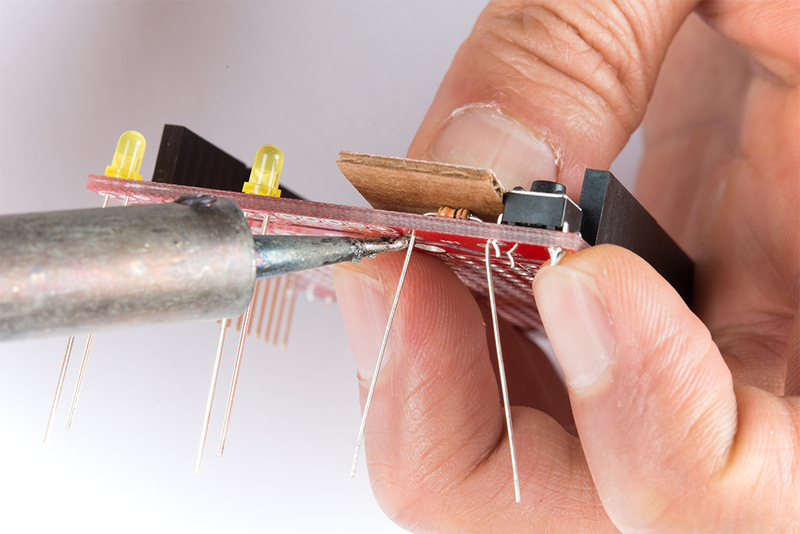 The resistor can get hot to the touch when holding the component down during soldering. At this point, feel free to grab a small piece of cardboard to hold the resistor down. When you are ready, tack one of the 10k&ohm; resistor&apos;s pins. Repeat for the 330&ohm; resistors. Check Alignment Before Soldering Away! At this point, it would be good to check the alignment of the components. Make sure that they are flush against the board and they are in its correct location. 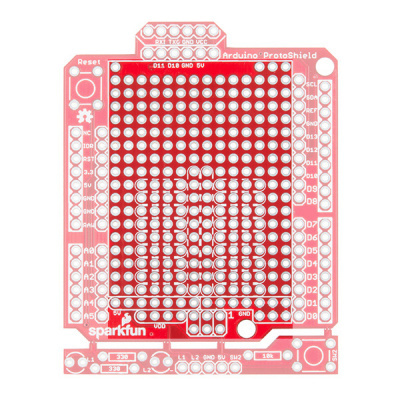 Did you add solder for the components on the bottom side? 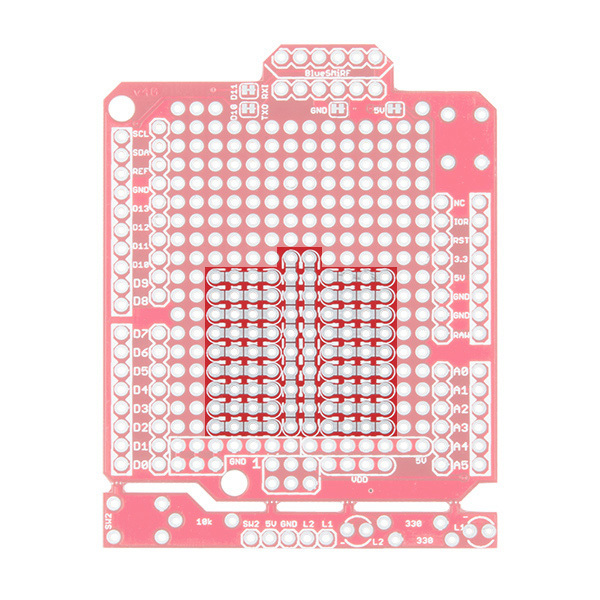 All of the components included in the kit should be soldered on the side of the jumpers. Everything good? Solder away! This is the fun part. Grab a flush cutter and trim off excess leads connected to the prototyping hardware. Careful not to cut off the stackable headers! If you used water soluble flux, clean the board off. 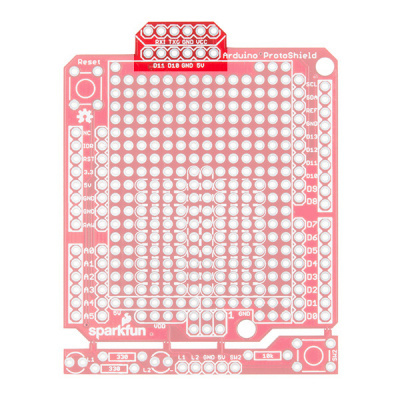 Otherwise, bask in the glow of your new ProtoShield for Arduino! Your board should look similar to the images below with the terminals soldered and cut. So what do you do from here? There are a few options! We left this up to the user to choose depending on personal preference. You can stick a mini-breadboard on the shield for prototyping small circuits. Additional headers can be added on however you would like for serial UART or in the prototyping area. For a lower profile, you can also strip hookup wire and solder cables against the plated through holes. For those sandwiching the ProtoShield with another shield, you can solder two 1x3 stackable headers for the ICSP pins. If you choose this route, you will need to go with a lower profile, using wires to connect the circuit. If you are finished prototyping, you can remove the mini-breadboard and solder your custom circuit to the prototyping area for a more secure connection. 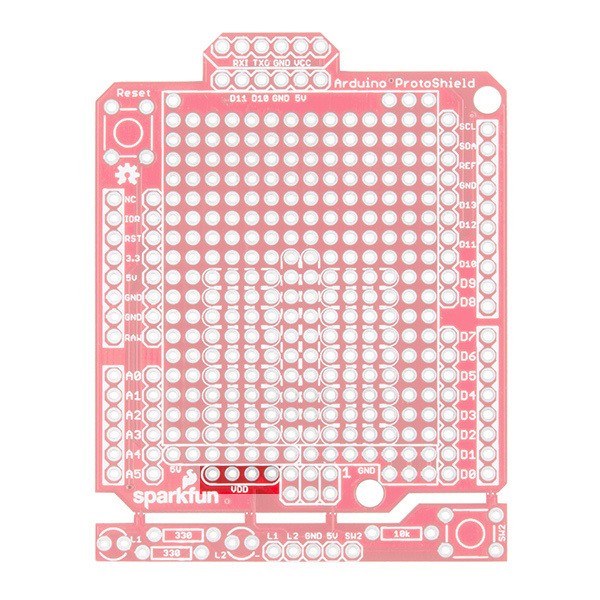 Want to use a different LED or a bigger button in your project? 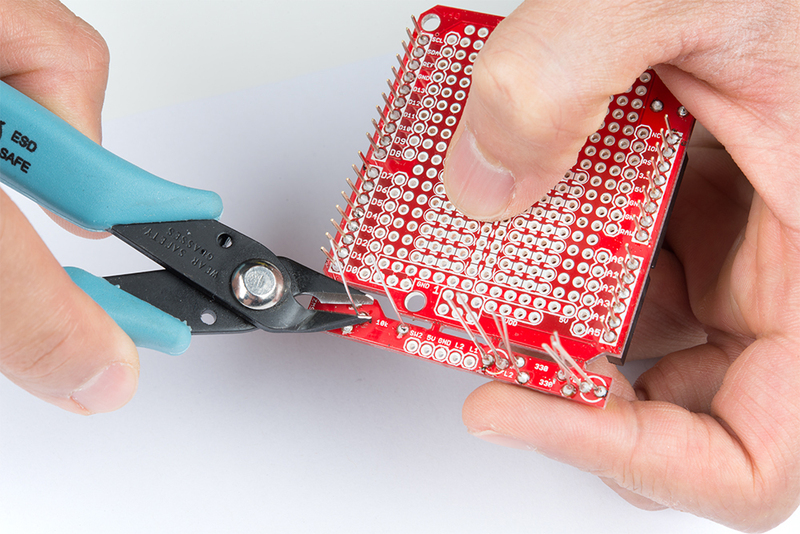 You can snap off the prototyping area using needle nose pliers and replace it with the hardware of your choice! Note: The following examples assumes you are using the latest version of the Arduino IDE on your desktop. If this is your first time using Arduino, please review our tutorial on installing the Arduino IDE. 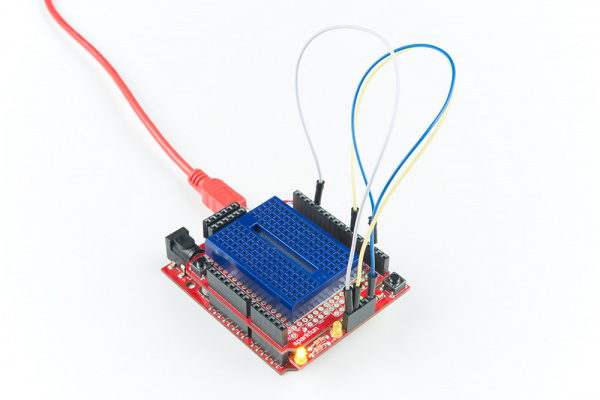 Let&apos;s connect L1 to pin 13 using a wire. 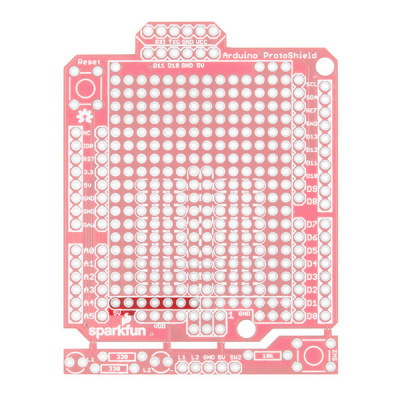 Assuming that you soldered to L1, connect it to pin 13. Copy the code below and upload to your Arduino! example in the SparkFun Inventor's Kit v3.3. // what L1 is connected to. LED labeled as L1 should begin blinking. Let&apos;s connect L2 to pin 6 and to fade in and out. 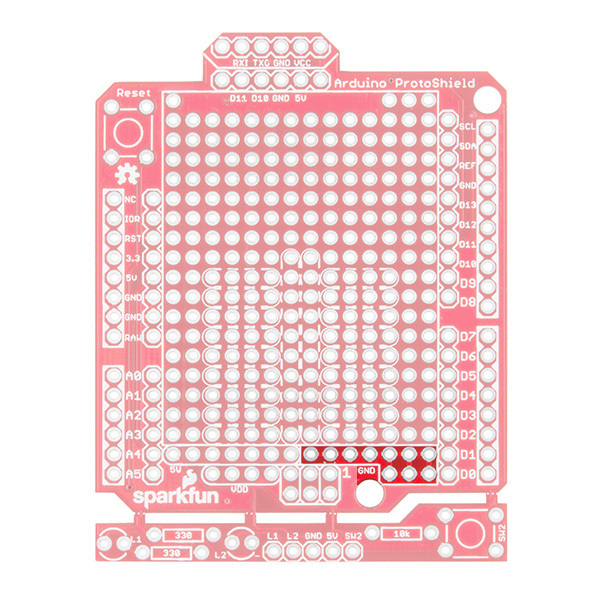 Assuming that you soldered to L2, connect it to pin 6.
in the LilyPad Development Board Activity Guide. 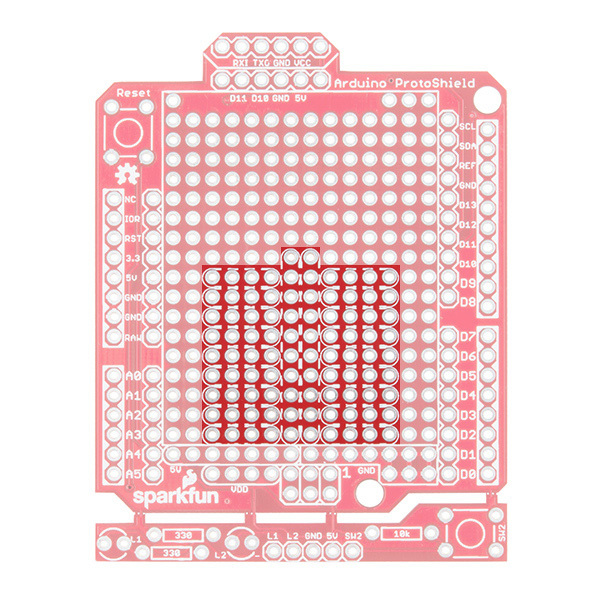 // The two "for loops" below will make a LED fade on and off in a "breathing" pattern. // using a command called "for". // NOTE that not all pins work with analogWrite! // the others will only turn on if brightness > 128. // Both types are used above, run the code and note the difference between them. // What if we want the LED to start at full brightness and fade to black? LED labeled as L2 should begin fading in and out. Try connecting and redifining the LED to another pin on your Arduino to see if you can still fade. Let&apos;s connect SW2 to pin 2 to read a push button. 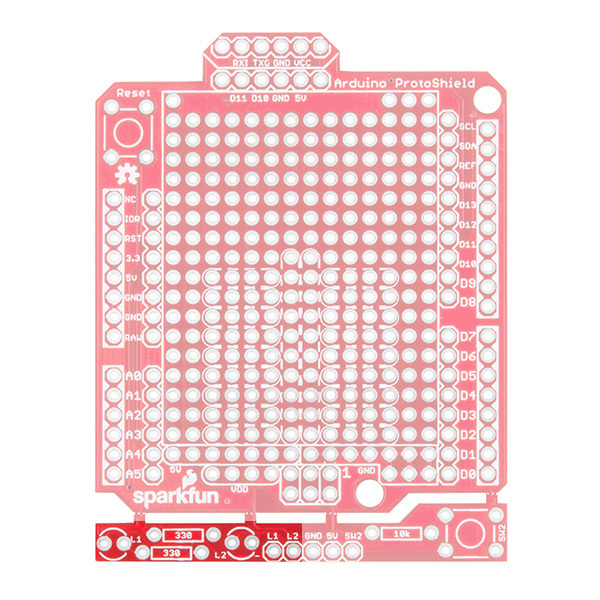 For feedback, we will be using both of the LEDs in our prototyping hardware. Assuming that you soldered to SW2, L2, and L1, connect it to their respective pins on 2, 6, and 13. 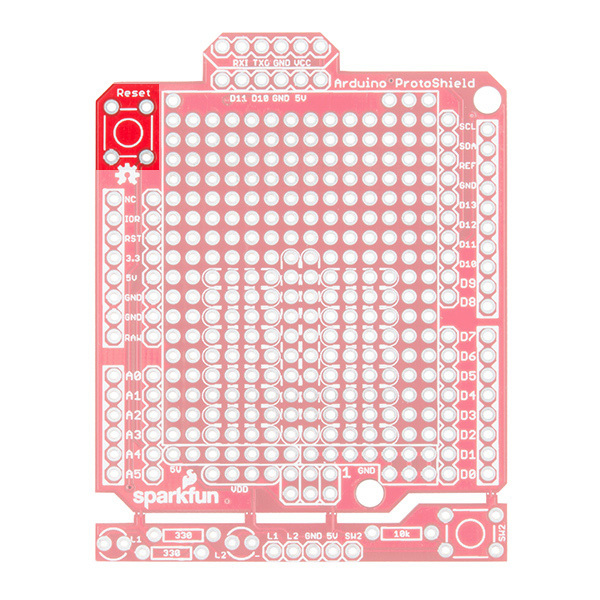 Pressing on the button should light up both LEDs simultaneously. Removing your finger from the button should turn them off. Let&apos;s try to send a character between two BlueSMiRF Silvers (i.e. the RN42s). In this example, we will need two bluetooths, ProtoShields, and Arduinos. Assuming that the boards are soldered, connect the BlueSMiRFs to the Software Serial UART port. We will be using the default connection to software serial pins 10 and 11. Simply align the silkscreen as indicated in the hookup table below. We will also be using the same connection to the prototyping hardware. Power both up, copy the code below, and upload to both Arduinos! This will pair and connect both bluetooths together. The address will be saved in memory and auto connect every time there is a power cycle. Open a serial terminal (since you can only have one Arduino Serial Monitor open at a time) set at 9600 baud and connect the other Arduino/ProtoShield/BlueSMiRF. Sending any character from the Arduino Serial Monitor should pop up on the serial terminal and vice versa! Combining It All to Send a Message! Let&apos;s send a simple message between the two bluetooths now that they are configured to autoconnect. Copy the code below, and upload to both Arduinos! This sketch was written by SparkFun Electronics. Passthrough Sketch by Jim Lindblom. Pressing a button on one of the Arduinos (as indicated by the blue mini-breadboard) should send a message and light up the LED labeled as L1 on the transmitting node. The receiving node (as indicated by the green mini-breadboard) will light up the LED labeled as L2 and print a message (in this case "Hi!") to a serial monitor or serial terminal. The other Arduino will to the same when you press on its button. Note: Take turns pressing on the push buttons to transmit. The message may get garbled when both bluetooths are transmitting simultaneously. Now that you've successfully got your protoshield for Arduino up and running, it's time to incorporate it into your own project!